January 6: You have discovered the joy of eating chocolate chip cookies. Today, you wanted one as a snack and sat like a big girl at the table and ate all of it, small bite by small bite. You offered to share with me, but as I started to take a bite, you pulled the cookie back and broke off one tiny crumb for me and smiled so big. It was pretty funny. Then you gave me the very last bite as you climbed out of the chair and ran off to play. Later, you decided you wanted another cookie and were not content with the half I offered you and insisted on sitting in this chair again to eat another whole cookie all by yourself. While you eat, you often say, “mmmm” just after you take a bite. You bring such joy to the simple moments of living. After talking with Ali about her experience with Project Life and being so inspired by her weekly posts in 2011 (and then looking at how other members of Becky Higgins' creative team approach it), I decided to jump in this year. And, I am so happy to report that the first week is almost done! As I was working on choosing the photos, I knew that I would want to add the above "chocolate chip cookie" photos + words to this week's story. I love how you can just add additional page protectors into the album and how there really aren't any rules, so I am working on learning a bit more about digital scrapbooking so I can add a few more stories here and there. And then I really want to use what I learn to create other books of other stories I want to tell with words + photos. A big thank you to Ali and Danielle for holding my hand through this learning curve. So the pieces above are what I will be putting into this first layout. Stay tuned...I think I am going to have a little too much fun with this. 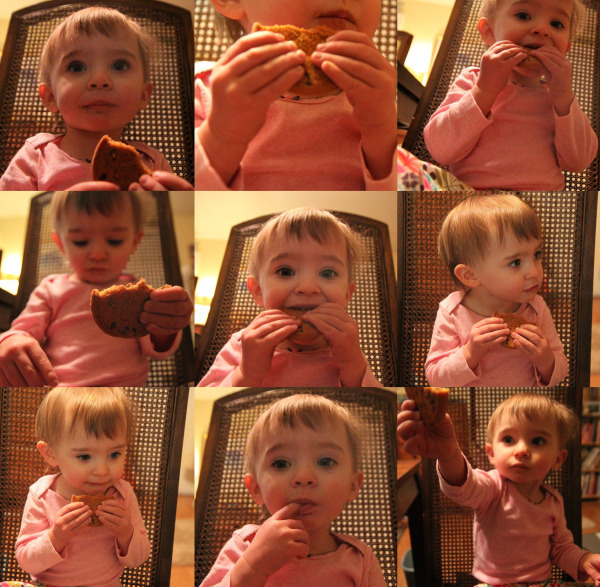 (edited to add) In the spirit of yesterday's post and your kind support (thank you), I want to share this other layer to the story: Seeing her devour this cookie and show such a big appetite made me so so happy. She is a wee one because of her heart issues and doesn't have much of an appetite because of the medication she is on. We have been in a "holding pattern" with her weight recently as she uses up all the calories she takes in as she runs and dances and explores, and we are hoping she will gain more this month. Although she will never have those baby fat rolls that so many people talk about, that I dreamed about when I was pregnant, I am just so happy she is here eating chocolate chip cookies and french fries and ravioli and blueberries and peas and brocolli. I am just so happy when I hear her say, "mmmm" after each bite.